We’ve decided to do a 12 Months of Birding at the Inn series on the blog, where we’ll talk about the kinds of birds you can expect to see at the Inn on Mill Creek (a site on the North Carolina Birding Trail) and in the surrounding areas of the North Carolina mountains. We’ve also taken lots of pictures over the years of the birds in our neck of the woods, and unless photo credit is attributed to someone else, all photos on the blog are ones that we’ve taken of our winged neighbors. 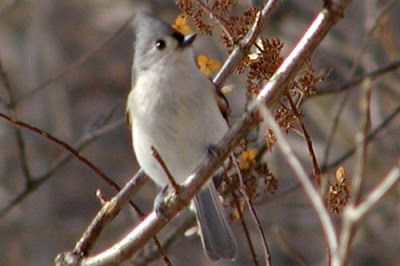 The Tufted Titmouse is a small gray bird that lives in our trees all year long. If you live in the eastern United States near a wooded area, you may have them near you as well. 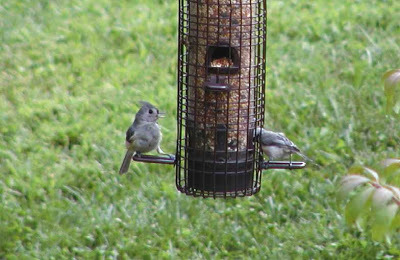 Tufted Titmice like to eat insects, as well as nuts, berries and seeds, and they are no strangers to the birdfeeders. They’ll often be the first ones to approach the feeders after we’ve put the seed in. They shadow our footsteps as we walk from the office to the feeder, hopping from branch to branch and singing out. They definitely know we’re their snack source! 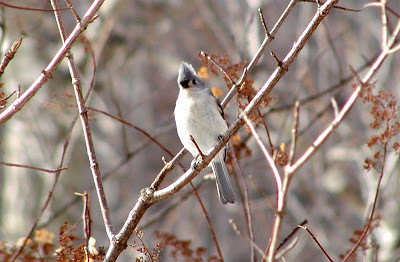 Tufted Titmice are little hoarders and like to store their food for cold weather months, so some of their trips to the feeder in fall and winter are for taking seeds, one by one, back to their storage sites nearby. You can identify a Tufted Titmouse by its gray back and white chest, and the black square/hourglass-looking patch between its eyes. It also has a little gray mohawk hairdo called a “crest”, which we think makes it resemble a Northern Cardinal just a little bit. 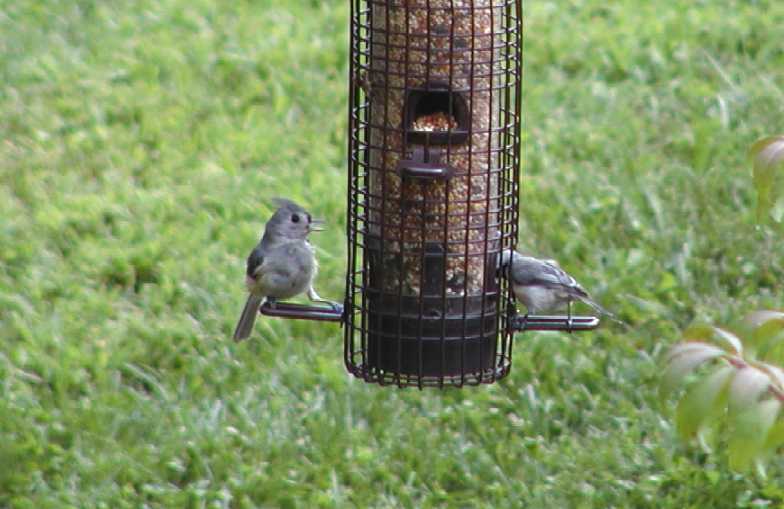 It’s very easy to get photos of our Tufted Titmice at the Inn…just watch the feeders on a sunny afternoon and chances are, they’ll be grabbing a snack! 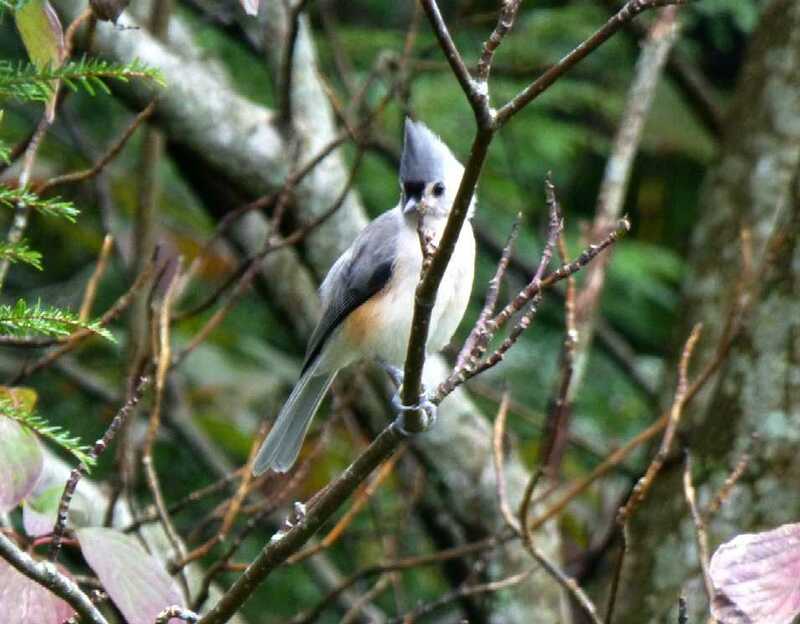 This entry was posted in Uncategorized and tagged 12 Months of Birding at the Inn, Asheville, birding, Black Mountain, Old Fort / Andrews Geyser, outdoors by Inn on Mill Creek. Bookmark the permalink.